LAWRENCE, Kan. – With the start of the regular-season less than a month away, the Kansas men’s basketball team hosted its annual media day Wednesday afternoon inside Allen Fieldhouse to discuss the highly-anticipated 2018-19 campaign. KU student-athletes gathered for photos with local and regional websites, magazines and newspapers before writers and videographers interviewed the 15-man squad on the floor of Allen Fieldhouse. 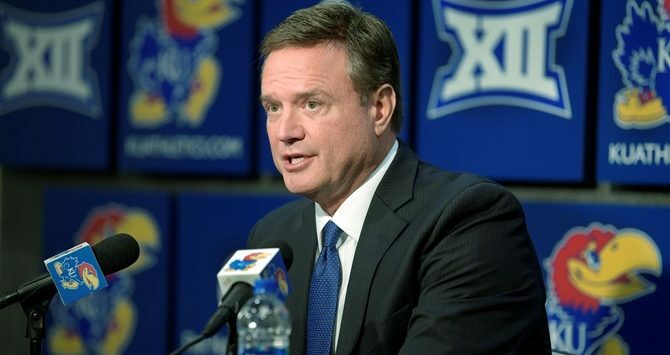 Entering his 16th season at Kansas, head coach Bill Self then previewed the team and the 2018-19 season with the media in the Allen Fieldhouse Media Room. Preseason top-5 in most publications, Kansas returns two starters and six letterwinners from last season’s 31-8 team which advanced to the program’s 15th Final Four, claimed its 11th Big 12 Tournament championship and won an NCAA-record 14th-straight regular-season conference title. KU opens exhibition play when it meets the Emporia State Hornets on Thursday, Oct. 25 inside Allen Fieldhouse.